Going to war? No need to let perfectly good food go to waste while you’re away fighting. 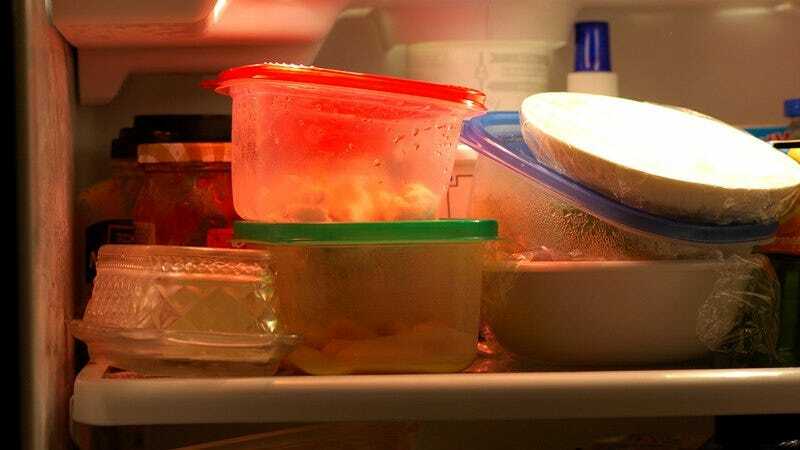 Here are five ways to ensure your leftovers remain fresh from the day you ship off to the day your tour of duty ends! 1. Freeze prepared dishes like baked ziti, enchiladas, and casseroles: It happens to everyone. You make way more stir-fry than you can eat in one sitting, and the next day you’ve got to wake up to go to war. Luckily, whether you’ll be involved in a quick surgical strike or a brutally protracted engagement, meals keep extremely well in the freezer and can be reheated whenever you want between enlistments or medical discharges. 2. Put pizza in an airtight container lined with paper towels: No need to scarf down that whole pizza you had delivered just as breaking news about the war took over every TV channel. Simply stack the pizza slices with a sheet of paper towel between each slice, wrap them all in plastic wrap, and head on out to boot camp. Then, if you make it back from the war, feel free to either reheat them or just eat them cold, however you prefer. Easy! 3. Don’t wash produce before storing it in the fridge: You’re in the army now. There’s no time to return home to check for mold growing on your fruits and vegetables, which will only be more likely to happen if they’re put in the fridge damp. Separate different produce and feel comfortable knowing you won’t need to use up all your military leave going back home to eat all your produce before it spoils. 4. Double-wrap soups and broths in Saran Wrap: Depending on how quickly peacekeeping operations fall apart or if you become a POW, you might be wrapped up in conflict for a long while, so it can’t hurt to secure your soups and broths twice-over with a healthy helping of Saran. Careful though: If the war escalates and spreads to U.S. soil and foreign invaders bomb your local power grid, thereby cutting off electricity to your fridge, room temperature soup will be a breeding ground for bacteria. If you’re going to fight in a place with a cold climate like Siberia or if temperatures plunge as the result of a nuclear winter, you might want to bring soup with you to war in large resealable freezer bags just in case. 5. Add a little lemon or lime juice to foods that oxidize quickly: War is a fact of life, and when it happens, there’s no choice but to go and leave extremely sensitive foods like bananas, apples, and avocados behind. However, a light coating of some citrus can go a long way in keeping them fresh while you’re engaged in a tactical combat event, saving you money and a whole lot of flavor. There’s no reason that becoming a patriot of the cause and not returning from war for decades on end should prevent you from eating fresh!